As I’ve mentioned several times on Twitter and on App.net, I’m working on a novel. It’s going relatively well, but I had some concerns about pace and structure, so I bought a copy of K. M. Weiland’s Structuring Your Novel on my Kindle. The book was very helpful to me, and I agree with its advice (he said modestly). It presents a theory of structure (drawing on many examples from historical and contemporary fiction, and even movies) whereby certain core ingredients of a story happen at certain points during the course of the novel. I wanted to visualise the structure as a chart, so that I could then see where my own story’s elements appeared, and how I could improve my novel. The result is shown below. 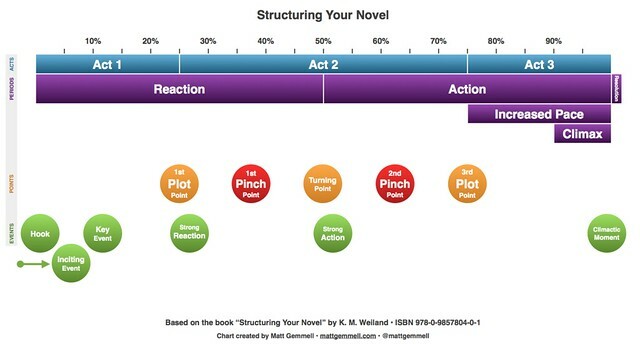 The diagram presents the advice from Structuring Your Novel in a concise way (slightly massaged for my own tastes), and should be useful for anyone who has read Weiland’s book - and I highly recommend that you do. You can download the chart as a PDF file. I hope it’ll be useful to you. If you like, you can also download the original (Numbers 2013 for Mac OS X) file, and I converted it to Microsoft Excel format too, although I can’t guarantee the fidelity of the Excel version. I’d like to thank Katie Weiland for her permission to share the chart with you. You can also find the chart on her blog. If you’re interested in further writing advice, you may wish to subscribe to her blog or follow her on Twitter. Lastly, I’ve written a few previous articles that might be of interest: a list of my tips for writing fiction, my fiction style guide, and a discussion of how I approach factual pieces.